Drop in support comes as top Democrats hash out details of government-sponsored health care proposals. 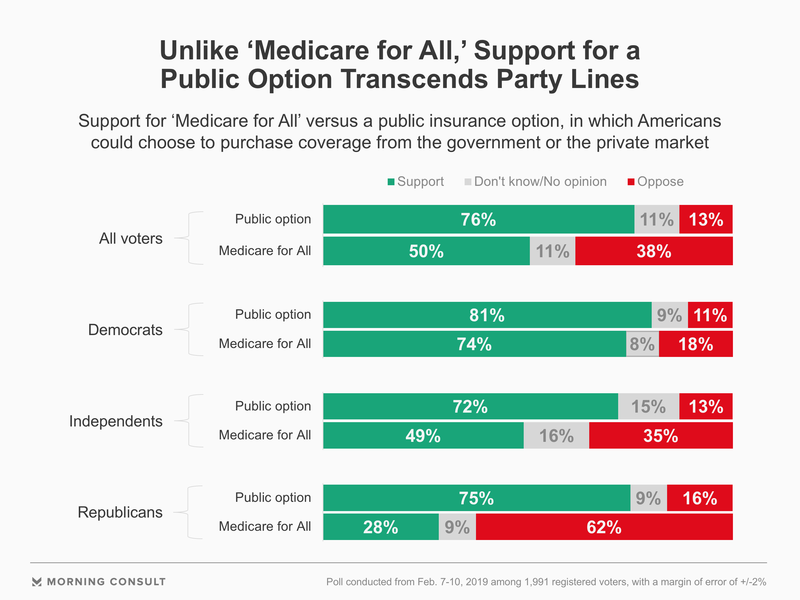 The elimination of private insurance causes half of ‘Medicare for all’ supporters to rethink their position. While top Democrats prepare to release health reform bills offering different iterations of single-payer systems and public insurance options and as Democratic presidential hopefuls begin building their health care platforms, “Medicare for all,” a long-cherished dream of progressive lawmakers and advocates, has come under increased fire from opponents who warn voters that they are at risk of losing their private insurance. 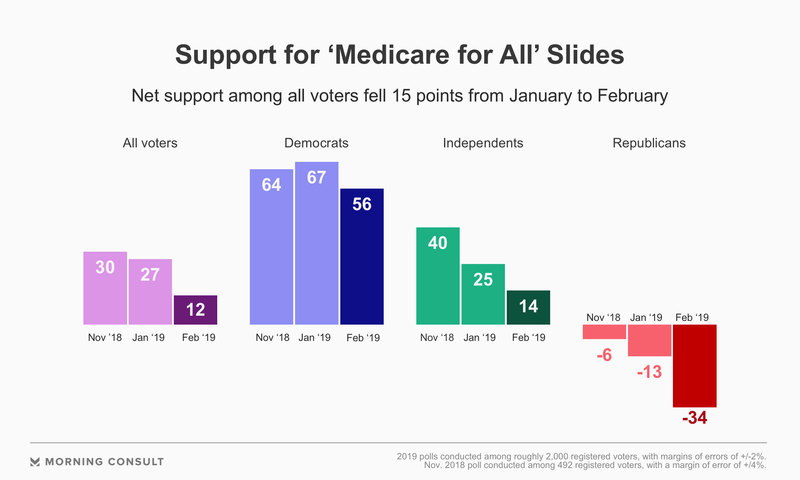 Although “Medicare for all” enjoyed net support of 27 percentage points (calculated by subtracting the share of opponents from the share of supporters) among registered voters at the onset of 2019, that share dropped 15 points in the Feb. 7-10 survey, to 12 points. The poll, which surveyed 1,991 voters and has a margin of error of 2 percentage points, found opposition to a system in which all Americans get their health insurance from the government grew among voters of both political parties, with net support sinking 11 points among Democrats and 21 points among Republicans. The last few weeks have found 2020 Democratic candidates and hopefuls — many of whom have historically backed different variations of a universal health care system — fielding demands for clarity on exactly what the pursuit of universal coverage entails. After Sen. Kamala Harris (D-Calif.), one of the top Democratic presidential contenders, embraced the possibility of enacting a “Medicare for all” health system that would completely eliminate the private insurance market, “Medicare for all” rapidly crystallized as the first major policy test for Democrats eyeing the nomination. “Medicare for all” has enjoyed majority support since November, thanks to the widespread, bipartisan popularity of the Medicare program. A Morning Consult survey in July 2018 found 62 percent of adults more likely to vote for a candidate who backed establishing a government-run health system for all Americans. But with the latest poll showing that 50 percent of voters support “Medicare for all” — now shy of a majority — Democrats are likely to find that turning “Medicare for all” from pipe dream to policy will be an uphill climb. Under a single-payer system true to the textbook definition, the federal government acts as that single payer, ultimately shuttering the private insurance market with the exception of non-duplicative private insurance. While different Democratic proposals offer varying timelines for the eventual elimination of employer-sponsored health plans, both Sen. Bernie Sanders’ (I-Vt.) “Medicare for all” bill and the legislation to be introduced by Rep. Pramila Jayapal (D-Wash.) and the Progressive Caucus this week do eventually phase out duplicative insurance plans offered to Americans at work, while guaranteeing coverage for all Americans. But the possibility of losing private insurance cuts support for “Medicare for all” in half. In the latest survey, when “Medicare for all” supporters were subsequently asked whether they would still back a government health system that eliminated the private insurance market, about 1 in 2 respondents (49 percent) reaffirmed their position, but just over one-fifth — or 22 percent — withdrew their support outright. Another 29 percent said they no longer knew or had no opinion. 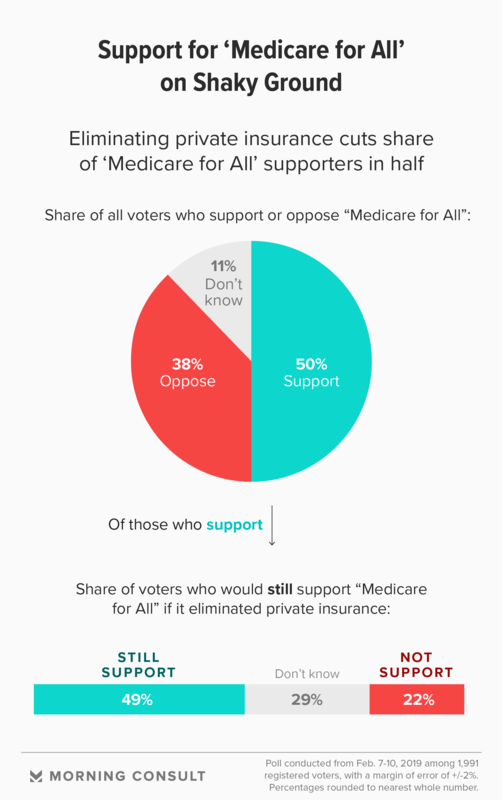 Though more Republican voters overall opposed “Medicare for all,” 42 percent of GOP supporters of this system would still back a system that cuts out private insurers, along with 54 percent of Democrats and 46 percent of independents. Instead, Bennet — alongside Sen. Tim Kaine (D-Va.) — is proposing a public health insurance option, in which a federally run health plan would compete with, rather than replace, private insurers. Their “Medicare X” plan does not require a tax increase nor guarantee coverage for all Americans, but public plan enrollees would continue paying premiums. Unlike the “Medicare for all” system, the popularity of the public health insurance option transcends party lines. About three-fourths of all voters (76 percent) support a system offering them the choice to purchase coverage either from the government or the private market. Historically, public option proposals win broad appeal because they fulfill the promise long sought after by opponents of single-payer systems and the Affordable Care Act: If you like your plan, you can keep it. Sens. Debbie Stabenow (D-Mich.) and Tammy Baldwin (D-Wis.) and Reps. Brian Higgins (D-N.Y.) and Joe Courtney (D-Conn.) plan to announce a bill today giving adults between the ages of 50 and 64 the option to buy into Medicare.